I love this poster by Joyce Valenza. 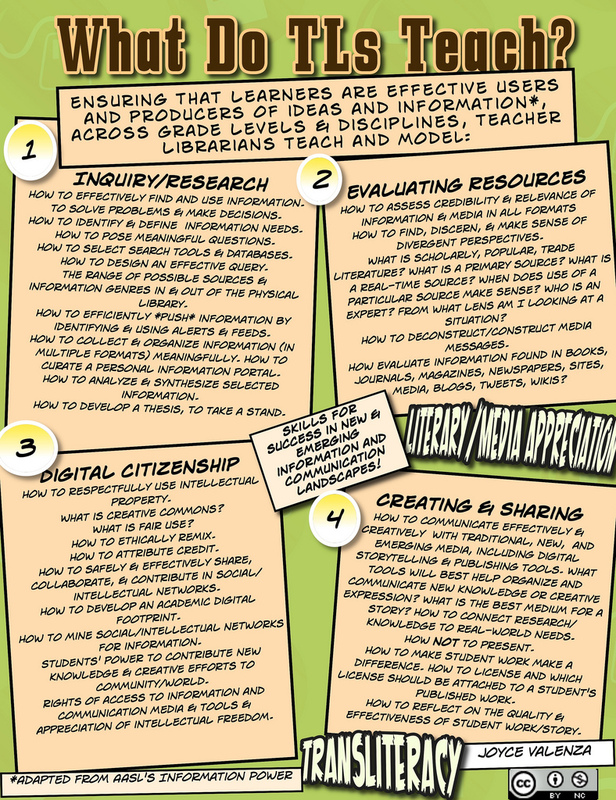 It really captures and affirms the role of teacher librarian as information literacy leader/specialist/teacher. The poster however, reminds me that teaching information literacy, although important, fits only some of the role statements (SLASA, 2003) or Standards of professional excellence for teacher librarians (ASLA, 2004) in relation to teaching and learning. Where does teaching literacy and literature promotion fit into “what do TL’s teach”? According to ASLA’s standards, excellent teacher librarians should also “foster an environment where learners are encouraged and empowered to read, view, listen and respond for understanding andenjoyment“. SLASA’s Role Statement clearly outlines that Literature promotion is also a key role of the teacher librarian. Exposing students to a range of genres, fostering a love of reading for leisure, promoting quality literature and collaborating with teacher’s to develop literature based reading programs is also an important role of the TL.